We present SQID, a property browser for Wikidata that we are currently extending to support logical inferences of new statements. 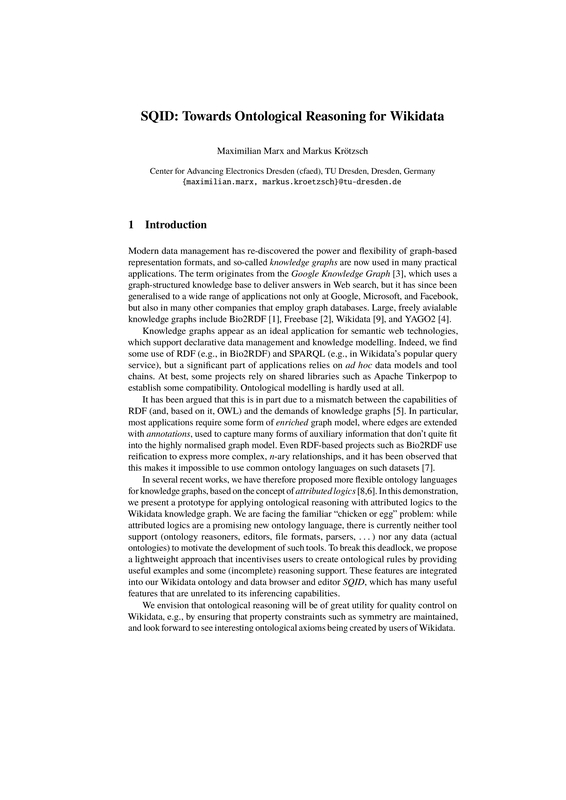 Our approach is based on MAPL Rules, a rule-based fragment of weak second-order logic, that we have recently proposed for dealing with ontological knowledge in Knowledge Graphs. We use a two-step reasoning process, where we first derive SPARQL queries from rule bodies that result in candidates for instances of the rules. From among these candidates, we obtain the matches by verifying the equalities of qualifiers specified in the rule, which may involve querying the Wikidata API for further data.